After several cold months of winter, I was ready to escape somewhere for a few days for relaxation and better weather. With only a few days at hand and a small budget available, a holiday to a tropical paradise was out of the question and, with it, went any guarantee of warmer temperatures for the weekend. Instead, I decided to investigate whether one of Europe’s popular summer destinations might offer an affordable off-season break with a chance for better weather. After a little searching across the low-cost flight carriers of Europe, I found cheap return tickets to Nice, France, and decided to book a four day getaway. 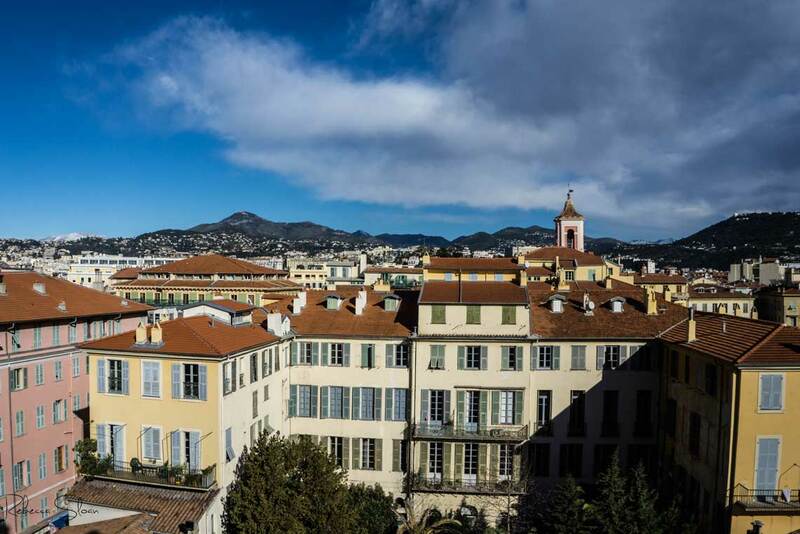 Nice is a coastal town in Southern France that’s nestled beneath the French Alps. Needless to say, as you come in to land, you’ll be in for a spectacular views outside of the window; I highly recommend you book a window seat on your flight to Nice. You’ll also want to make sure you have a camera readily accessible so you can take some pictures of the view on your descent. Check out this amazing view over Nice from the plane as it comes in to land. 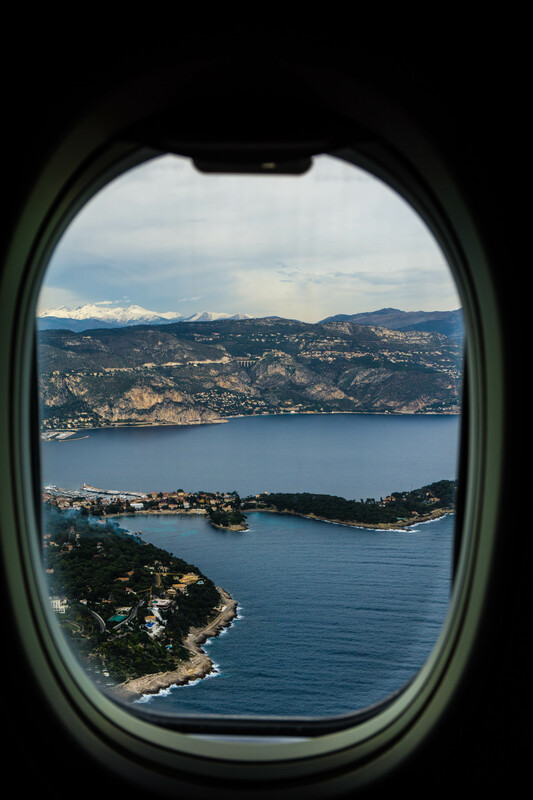 As the plane descends towards Aeroport Nice Cote d’Azur, you’ll be treated to spectacular views across the Alps and a breathtaking view of the coastline. During our flight, the French man sitting beside us pointed out that it’s possible to view three countries at once – France, Italy and Monaco – during the descent. In order to see this view, your plane will need to approach the airport from the ocean (ours actually flew out to the ocean and then circled back for the descent – I think this is fairly common) and you’ll need to be looking out of the right side of the plane. An incredible view of the coastline can be seen from the plane as it descends to the airport. Our trip took place during the last weekend of January, 2015, and the temperature generally hovered between 11-14 degrees Celsius. The sun shone for most of our holiday, and at times was fairly warming, although a strong mountain breeze often blew through the city, bringing a nip to the air. Unfortunately this means you will still likely need a light winter coat or a heavier spring jacket if visiting the south of France in January. Still, the weather was much better than our home in Amsterdam and we did manage to sit outside on a few occasions to enjoy a glass of wine and some nibbles, without a jacket, when the breeze calmed and the sun shone. The sun shined for most of our trip, but a cool breeze off the alps kept the temperatures slightly chilly. Nice if the fifth most populous city in France, so most of the city will remain open during the winter and there will be plenty of things to see and do during the winter. Unfortunately, although Nice’s large stone beach is a popular bathing spot in the summer, it will be far too cold to go swimming in the winter. We were in the city for four days and saw most of the things we were looking forward to seeing within about two days. The rest of our time was spent simply exploring the streets, enjoying each other’s company over a glass of local wine, or taking a day trip to another nearby area of interest. Fortunately, it’s fairly easy to get from place to place using public transportation and we managed a day trip to the medieval town of Eze and to the country of Monaco. You can also read up, and view a video, of the activities we checked out while in Nice. Getting to and from Aeroport Nice Cote d’Azur is fairly easy. There is a dedicated shuttle bus which will collect you from right outside the terminal and take you into the center of Nice. At the time of writing in winter/spring 2015, the shuttle costs €6 per person, one-way. Within the city, there are a number of trams which you can access (although no metro system). We used the tram on one occasion, but needed help from a local to work out the payment machine (which was onsite at the stop) as it was only in French. It also was slightly confusing as there is a knob to the right which you use to make your selections. It took us some practice to (sort-of) get the hang of it. Thankfully we found a friendly local lady who was happy to help us select the right tickets for the tram. After buying your ticket, you will then need to get it authenticated by punching it into a ticket machine on board. If you visit the region, I highly recommend you take a day trip, or two, through the local area. Although it’s possible to travel at a faster speed by train, taking the bus will give you some spectacular views of the coastline. 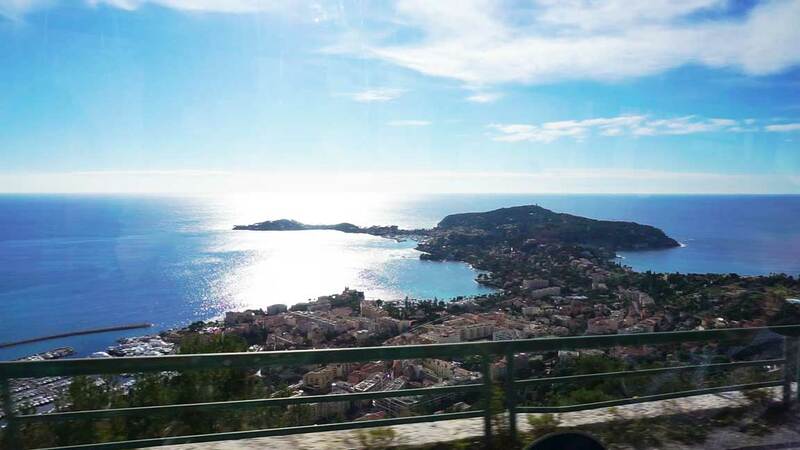 The view during the bus journey from Nice to Eze will not disappoint! It’s well worth spending the extra time traveling by bus rather than train to get there. While visiting the area, we checked out the medieval town of Eze and the country of Monaco. 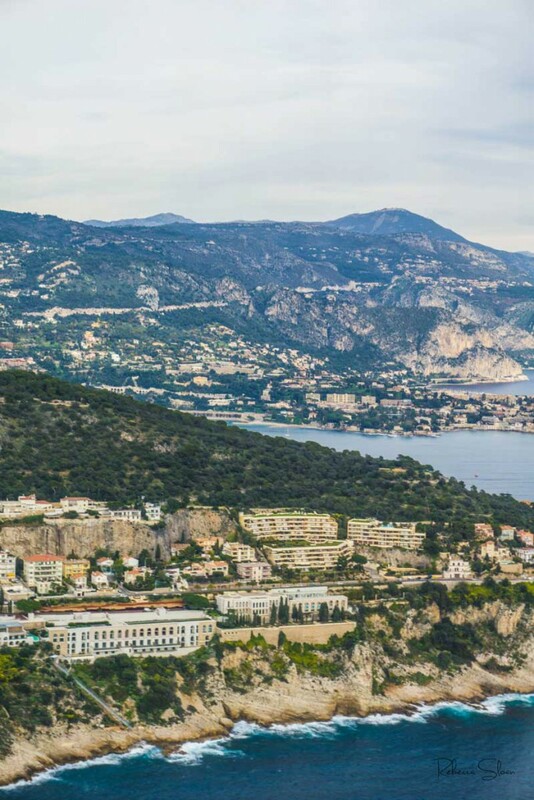 From Nice, there are a few buses that will take you to Eze and offer you a stunning view of the city. We took the #112 Monte Carlo Casino bus which stopped just outside of Eze. To get to the bus, we caught a tram to the bus station, just outside of the city centre where we boarded the bus. You can buy your ticket on-board the bus and it will cost a couple of euros. Before leaving to catch the bus, you’ll want to check the bus schedule for both departure and collection. We found out after exploring Eze that the bus only arrives in the area once every few hours (although you may be able to grab another bus or a train to your next destination). 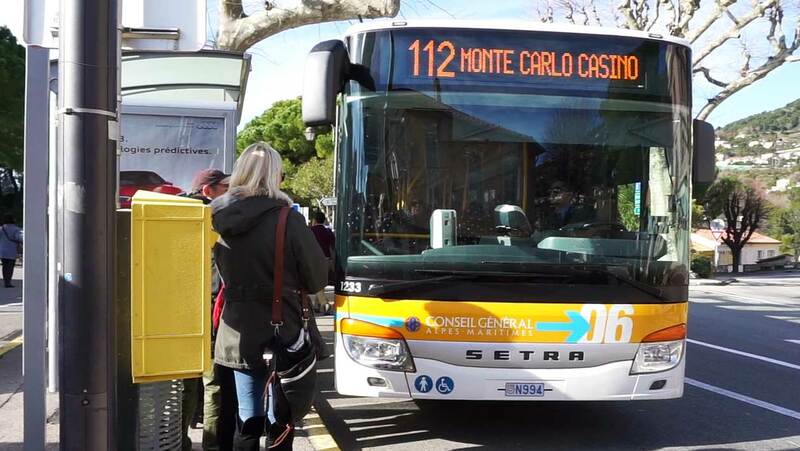 The #112 bus runs from Nice to Monte Carlo Casino and stops in Eze. This is not the only bus that travels to Eze though, you can also board the #100 Menton and the #82 bus (here’s the #82 bus schedule accurate as of April 2015). A note about the bus ride; it is a coastal route and will take a number of twist and turns. If you have an easily unsettled stomach, you may want to take some gravel before the trip, or sit near the front and keep your eyes looking forward as opposed to the side of the bus. We didn’t find the ride too bad, and forgot about most of the turns because of the beauty of the journey, but you’ll want to keep this in mind, or maybe take the train, if these types of journeys unsettle you. Like many European countries, local trains provide an affordable way to travel between cities in a region. The transportation in the south of France is no different and enabled us to affordably travel between Nice and the country of Monaco. However, as with the tram systems, we found the ticketing machines fairly confusing to use. Although you’ll be able to find ticketing agents at the bigger stations, there may not be personnel at the smaller stations such as Eze from which you can get some assistance in booking the right tickets. unfortunately, because of this, we ended up buying the wrong tickets by accident (buying a reduced fare for €2 less per person than the tickets we should have purchased). This mistake was going to cost us. When we arrived back in Nice after our day trip, we were confronted by close to a dozen train station ticketing agents, local police and a sniffer dog, all of whom were on duty to check people’s tickets. Having not realized we had purchased the wrong ticket, we were incredibly surprised to be confronted with hostility by the ticketing attendants who accused us of trying to cheat the system. We explained the situation to them; that we had come from a station where there was no one on hand to help us and we had, evidently, misunderstood the ticketing machine and purchased the wrong tickets. We offered to pay the extra amount or buy completely new tickets, but they demanded we each pay a €25 fine each (€50 total) or go to the police station to explain our story and pay an even higher fine. They insisted that there was an English translation to the machine, but when we asked them to show us how to get to it so as to avoid this situation in the future, they were unable to do so and, after a few minutes, simply shrugged their shoulders and abandoned the machine. We later found out that many of the agents that had acted so hostile to us at the station were in fact sales agents. Perhaps this explains why they were more intent on fining us then on helping us to figure out the ticketing machines to ensure we could use them properly on future trips. Ultimately, this experience did affect our views on the region as we feel the hostility we were treated with was completely uncalled for. In hindsight, I wish I had taken photos/videos of the situation to show you how ridiculous it was, but at the time I did not feel safe doing so and worried that they may have tried to confiscate my camera. There really was no need to treat us like criminals and threaten to send us for questioning at the police station for a measly €4 we owed due to a mistake buying our ticket. Ultimately, we paid the fine and walked away fine, albeit a little shaken from the confrontation. Despite our experience, there’s no reason to believe this will necessarily happen to you. Just make sure you get help from a ticketing agent when buying your ticket or find someone who can help you work the ticketing machines properly. Do this and you shouldn’t have a problem. Although our hotel offered a breakfast of breads, meats, eggs and yoghurts, we generally opted out to have a more local breakfast experience. There are plenty of touristy restaurants downtown that will offer breakfasts for between €5 and €10. These breakfasts typically feature coffee, orange juice, a baguette with butter or jam, and a croissant. More expensive breakfasts may also include cheese and a hard boiled egg. Instead, we opted to visit a local bakery and order a fresh croissant and cappuccino for a few euros. We did originally arrive in the city with the hopes of going for breakfast at a creperie but, after much searching, discovered that crepes really aren’t served at breakfast here. Instead, it’s more of a lunch or dinner food. We were initially a little surprised by how easy it was to find Italian food in Nice. Of course, it makes sense considering how close the Italian boarder is and that the city has a long history with Italy. We were, however, very surprised to find it quite difficult to find traditional French food for descent prices. When we travel we always try and eat where the locals eat. Our local greeter, Gaetan, recommended we visit Restaurant du Gesu in Nice’s old town for traditional French food. At this restaurant, we enjoyed a selection of local appetizers and some local wine. It was perhaps the best example of traditional Nicoise food which we encountered during our short weekend break (but even at this restaurant we watched as the locals consumed large plates of pasta). 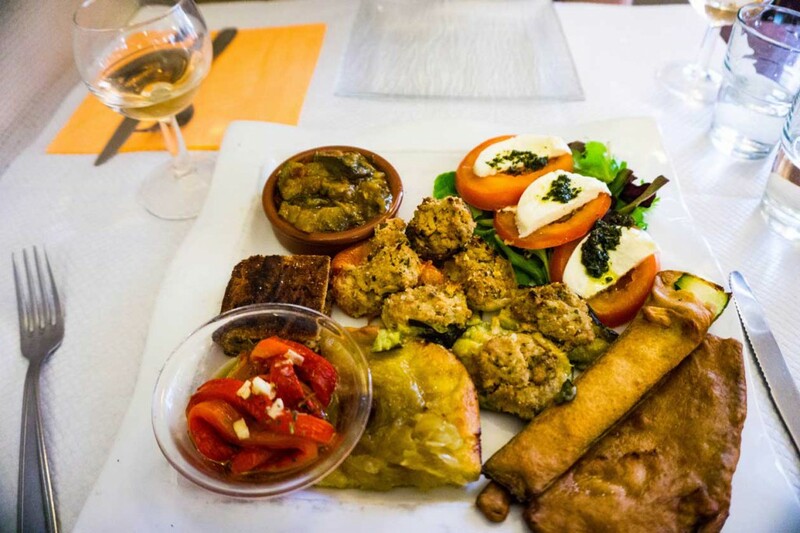 A plate of traditional appetizers from the region which we sampled at Restaurant du Gesu. Most days at lunch we would typically stop at a restaurant and share a pizza or a plate of appetizers. This would cost us between €10-€15 all together depending on what we purchased. Drinks, of course, would be an additional cost and I should point out that most restaurants will insist you buy a bottle of water, rather than provide you with a complimentary glass of tap water. 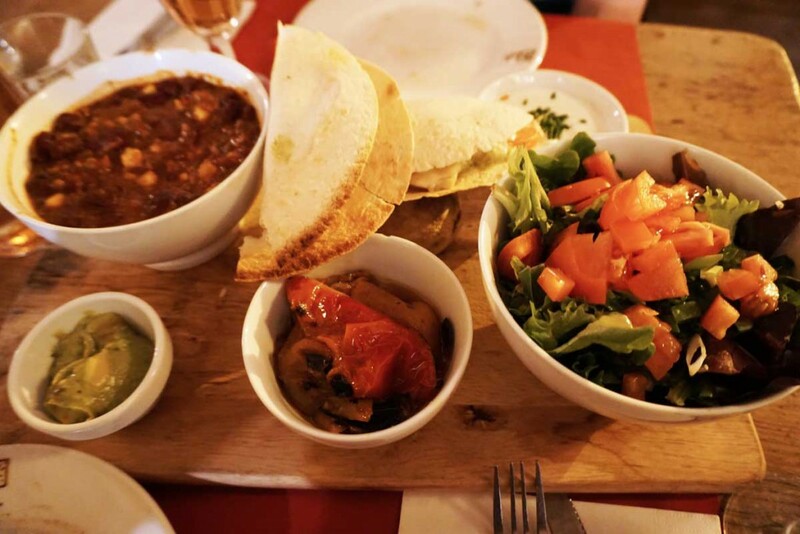 It’s also possible to grab a pastry or slice of pizza from a little cafe, but after hours of walking around the city we personally quite enjoyed being able to sit down in a warm restaurant and take our time enjoying a freshly prepared dish. As we tended to stop at restaurants for a shared lunch, the prices of the main meals at dinner were fairly similar in price. We found the average price for a main course in Nice would vary between €10-€20. Typically, we would visit restaurants where our main meals would cost no more than €14 a dish though. Our usual meals would include a main dish each, some local wine, coffees and the occasional desert to share; making the average cost of our dinner cost approximately €40. We struggled to find many places to try traditional food in the the area, but this restaurant came highly recommended so we checked it out instead one night. Yes, that is a version of Mexican food that we’re eating… not local but at least it was tasty! 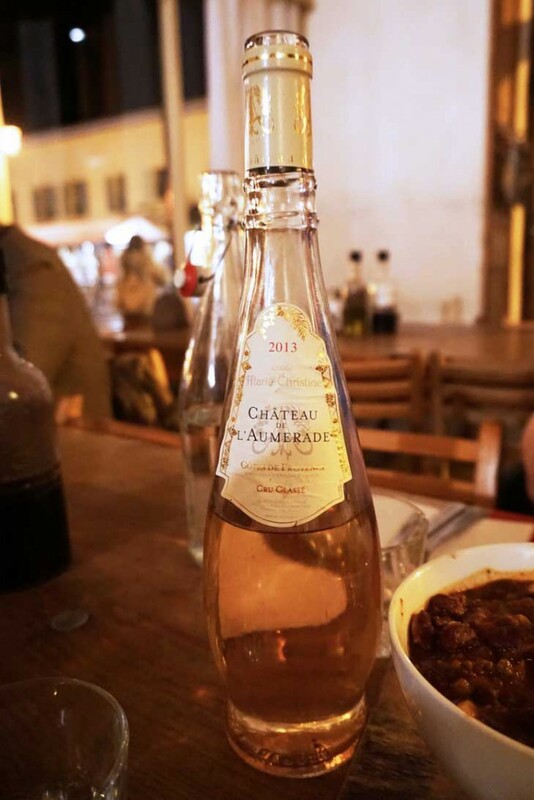 We were advised to always buy the house wines in Nice, and we were not disappointed. Typically we’d spend between €8-€12 for half a litre of (fantastic) wine during our meal. This was a lovely bottle of rose wine from the area. In fact, we didn’t have a bad local wine during our time in Nice. Nice certainly wasn’t as cheap as we were hoping it would be. And although the food was good, it didn’t blow our socks off. The wine, however, was phenomenal! Seriously, try the local rose wines. Not only is it cheaper to buy the local wine than it is to buy beer or spirits, but every one of the wines we tried was fantastic! And this is coming from someone who doesn’t normally drink rose wine. Aside from the costs, we did really enjoy wandering around Nice’s Old Town, checking out the view from Le Chateau (not actually a castle but it does have a spectacular view across the city) and walking by the beach. In the winter, the city is still bustling and there is lots to do. Admittedly there was a lot more that we could have done, such as visiting a number of museums, but didn’t do simply because it didn’t particularly interest us. In truth, perhaps our favourite experiences during this trip actually came during our day trips to Eze and Monaco. Ultimately we’d seen all we wanted to see in Nice within two days and were really glad to explore Eze and Monaco which will offer you a completely experience from that of Nice. We had a spectacular time during these trips and Nice makes an excellent base for exploring the local area.